Sam Smith and Beck might have taken home the statuettes, but according to SoundHound, the big winners from the Grammys were Ed Sheeran and Jeff Lynne. Sheeran, who was up for several awards, performed “Thinking Out Loud” during the show. It was the most SoundHounded song of the event and also translated into the most purchases through the app. Sheeran also performed with Lynne, who fronts Electric Light Orchestra. Their rendition of “Evil Woman” was the most SoundHounded performance, and SoundHound dubbed Lynne the night’s break-out artist. 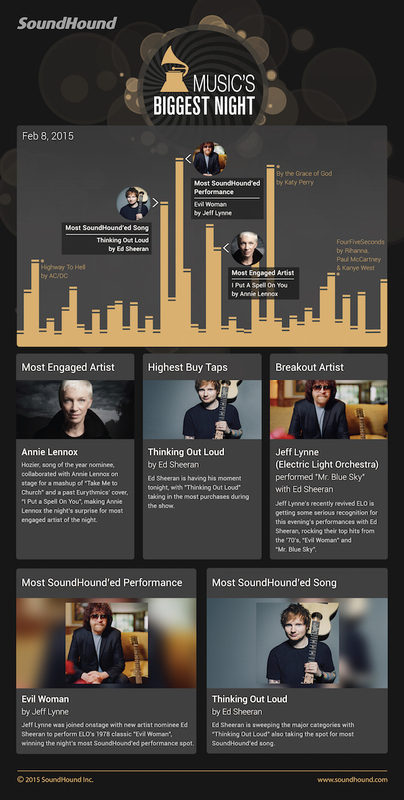 SoundHound also highlighted Annie Lennox as the most engaged artist, thanks to her performance with Best New Artist nominee Hozier. The graphic also showed a lot of listener interest in Katy Perry’s performance of “By the Grace of God,” which was just behind Sheeran for the top song. Shazam also got in on the post-Grammys data dive, sharing its own top moments and top purchases from the event. Lynne and Sheeran’s performance of “Mr. Blue Sky” was the most Shazamed song, followed by Katy Perry’s performance in second and Sheeran’s “Thinking Out Loud” in third. The latter Sheeran song was also the most purchased song during the broadcast, and Hozier’s “Take Me to Church” was the runner up.